The Srnec Theatre in Prague is the home of the world's first black light theatre company. Led by the inventor of the genre, Jiří Srnec, they have played to over 5 million people in 68 countries, constantly changing and evolving their shows. Now based back in Prague, their current show Antologia is a collection of the best scenes from these performances, which stretch back 50 years. It showcases the theatre's favourite black light techniques. 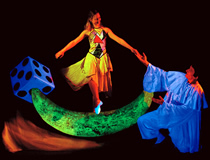 Black light theatre is a typically Czech art form, a world of illusory creations and hidden secrets. The story is told through a magical mix of colourfully dressed mime artists, puppets, singers, dynamic dance routines, ballet, animated film, state-of-the-art visual effects and dramatic sounds. Stories are emotional and can include wonderful comedic touches. In black light theatre the story is recounted visually, with little or no spoken words. This makes the shows ideal for an international audience, of both adults and children. Antologia plays daily at the Srnec Theatre in the centre of Prague, just a few minutes walk from both the Old Town Square and Wenceslas Square.